What makes the Healing for Harmony incense unique is that vibrational essences have been added to the incense mixture, so that when you use them the energy of the essences is also being released in to the atmosphere. 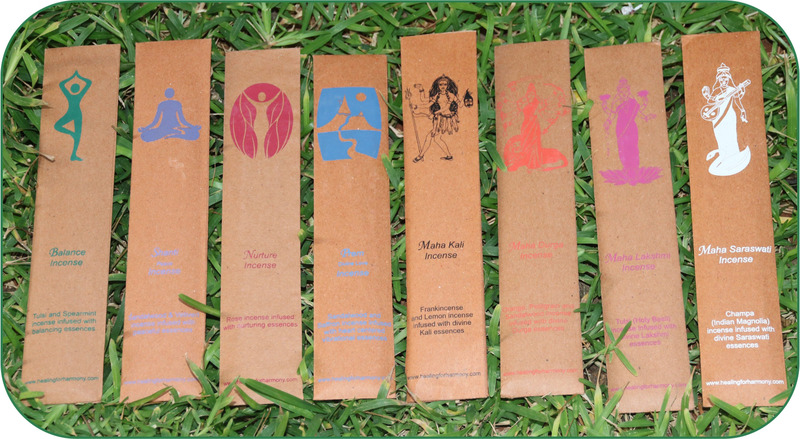 All incense is handmade using natural ingredients and fairly traded, with recyclable packaging. To read more about ingredients and production of the incense click here. All incense packets contain 20 sticks. Fragranced with Spearmint and Tulsi (Holy Basil) essential oils, this contains a combination of vibrational essences that are grounding and balancing. A great incense to use during a yoga or bodywork session, or for when you feel that you are off-balance! Fragranced with Sandalwood and Vertivert essential oils, this contains a combination of vibrational essences that are calming and relaxing. Good to use when you wish to unwind after a stressful day. Fragranced with Rose essential oil, this contains a combination of vibrational essences that are soothing, creating an atmosphere of feeling nurtured. Many of the essences in this incense have a Divine Mother quality to them. This incense is good to use when you wish to nurture yourself and during times of emotional upset. Fragranced with Saffron and Sandalwood essential oils, this contains a combination of vibrational essences, which were made at various sacred spots along the Ganges River in the Indian Himalayas. These rather special essences all assist with opening the heart, and resting in being. Kali is the Hindu Goddess of surrender, dispelling negativity, being fearless, and slaying of the ego. She is benevolent and compassionate, despite her fierce form. This incense is fragranced with Frankincense and Lemon essential oils and contains an essence that was made during Arati (evening prayers) at the Maha Kali temple in Dakineshwar, Kolkata, India. This incense can be used during meditation or contemplation, or for space healing. Durga is the Hindu Goddess of courage, empowerment and transformation. This incense is fragranced with Orange, Pettigrain and Sandalwood essential oils and contains essences that were made at various Kali and Durga temples in India using the crystalline energies of Fire Opal and Smokey Quartz. Creates an atmosphere where you can attune to the divine qualities of Goddess Durga. Lakshmi is the Hindu Goddess of abundance and flow. This incense is fragranced with Tulsi (Holy Basil) essential oil and contains a combination of Maha Lakshmi vibrational essences whose qualities are flow and abundance. The essences were made at Lakshmi Temples and during a Lakshmi puja. Creates an atmosphere where you can attune to flow and be open to the divine vibrations of Goddess Lakshmi. Saraswati is the Hindu Goddess of creativity, inspiration and wisdom. This incense is fragranced with Champa (indian magnolia) essential oil and contains essences that were made at the present day Saraswati river. Creates an atmosphere where you can attune to the divine qualities of Goddess Saraswati.